It’s Back…Starbucks 12 Days of Gifting! Here is the line up: | ...and another cup of coffee. The Starbucks 12 Days of Gifting is back this year! I love this sale every year, so below is the schedule. These deals are in the store only, but you can still get a great deal from Starbucks.com today and save $25 off a $60.00 purchase! December 6: Buy a Salted Caramel Creme Puff, get one free! December 7: $5 off Starbucks Candy Twist Tumbler 12oz size. 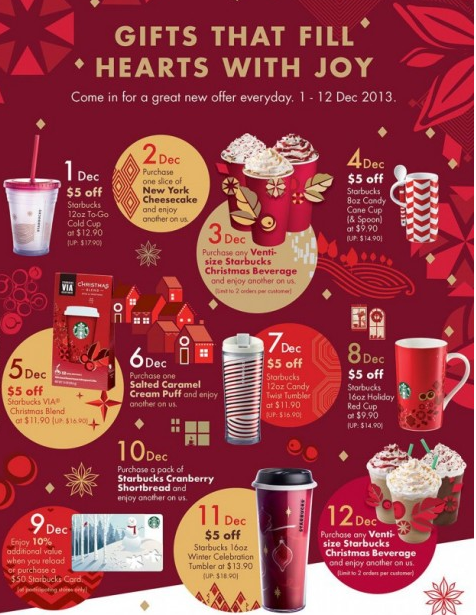 December 8: $5 off Starbucks Hiliday Red Cup 16oz size. « Hot Starbucks tumbler deal!! !